What in god's name is Kohlrabi. And Okonomiyaki? Can't pronounce it. I have been fortunate to have experienced cultures from across the world, which in turn has led me to crave the discovery of all sorts of global cuisines, generally through my personal consumption, but whenever I can, through local cooking classes. But in all honesty, Japanese food is never something I properly looked into, other than endless sushi dates and that Sushi making party that one time...Until my mum brought home the strangest looking vegetable I'd seen in a long time, and Food 52 just so happened to feature it on their CSA. Too perfect of a coincidence NOT to try my hand at it. 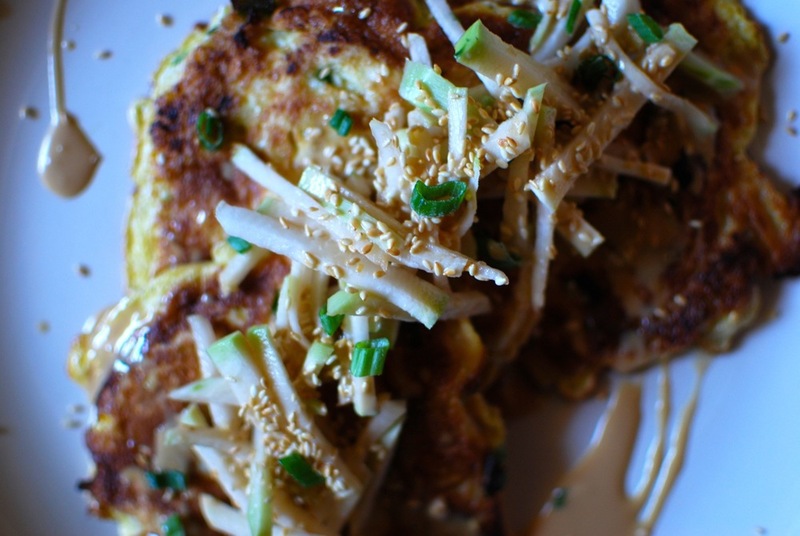 Hence, Kohlrabi Okonomiyaki with lightly pickled Kohlrabi Slaw. SO easy, delicious, and infinitely variable, which, you guessed it, makes it the perfect leftover saver and bestover recipe staple. Add it to your pile. 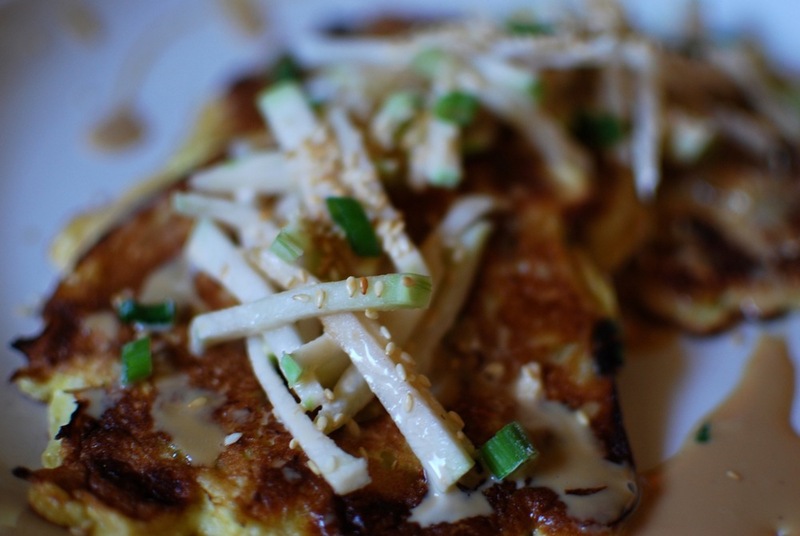 I'd also just like to thank Food 52 's PERFECT Kohlrabi CSA timing, Mrs Larkin for the ingenius inspiration, and the marvelous Midge for the Okonomiyaki recipe base. Yes that's a lot of tags. But I felt it was important to thank them all for their contribution to my first ever self-made, home-made, Japanese dish, and teaching me how to use a vegetable I had no idea existed until about a week ago. So excited I had to share. 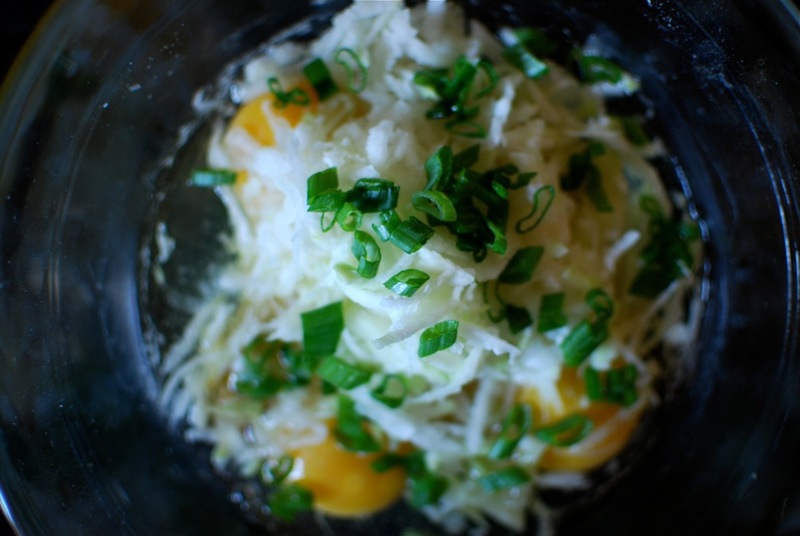 Finely slice your half Kohlrabi bulb, length wise, then julienne (chop finely into thin strips). Into a bowl, add your julienned Kohlrabi, vinegar, soysauce, pinch of cayenne pepper to taste and dash of your mashed/finely chopped ginger. Set aside and allow to pickle/marinate until time to serve. Whisk together the Sauce ingredients, adding a Pinky-Finger-Nail sized amount of your ginger (yes, that's a valid measurement), until fully incorporated and smooth. For the pancakes, whisk together the eggs, soy sauce, salt and sesame oil. Once combined, add in the flour until fully incorporated. Finally, fold in the shredded Kohlrabi, and most of the finely chopped scallion, (keeping some aside for sprinkling upon service). Heat a couple of tablespoons of your chosen vegetable oil in a pan, over medium high heat. Once ready, drop in about 1/4 cup of batter, and cook 2-3 minutes on each side. Keep warm while you cook the rest. Having used up all your pancake batter, arrange on a serving plate, top with slaw (you can pour any remaining liquid into your sauce, whisking well, until smooth again), drizzle over sauce and top with toasted sesame seeds and remaining scallion. For breakfast, (brunch), lunch, or dinner. Add about 1/4 cup of your ground meat of choice (pork, chicken, remembering to season accordingly) for extra protein to the okonomiyaki (pancake) batter. For a seafood option, toss in 1/4 cup baby/chopped shrimp, or even clams/mussels. Top with bacon, because, why not.